Thousands of Phoenix, Arizona homeowners could refinance into a mortgage with a lower interest rate, thereby saving money each month — but many of them don’t even know it. This has prompted the federal government to launch an awareness campaign designed to educate eligible borrowers. According to a government report released in May, approximately 18,000 Arizona homeowners are currently eligible for the Home Affordable Refinance Program (HARP). Roughly 10,000 of these homeowners are located within the Phoenix metro area, Arizona’s densest population center. The HARP program offers refinancing options to people who wouldn’t otherwise qualify, including those with little or no equity in their homes. In fact, Arizona homeowners who are currently upside down in their homes (meaning mortgage balances exceed their house values) could still qualify for refinancing through HARP. According to a fact sheet published by the Federal Housing Finance Agency (FHFA), HARP is the only program that allows underwater Arizona homeowners to refinance their home loans. To be eligible for this program, Arizona homeowners must be current on their mortgage payments at the time of application. Additionally, the existing mortgage loan (the one being refinanced) must have been sold to Fannie Mae or Freddie Mac on or before May 31, 2009. Homeowners must not have had any late mortgage payments within the last six months, and no more than one late payment within the last year. The infographic on the right (courtesy of HARP.gov) explains who might be eligible for mortgage refinancing through HARP. You can click the image to enlarge it. The program deadline was originally scheduled to expire at the end of this year. It was recently extended through the end of 2016. 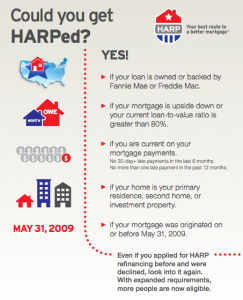 This gives Arizona homeowners additional time to take advantage of the refinancing benefits offered by HARP. In 2014, the Federal Housing Finance Agency (FHFA) began a series of outreach events in key cities across America. The agency is mainly focusing on metro areas with the highest numbers of eligible borrowers — places like Atlanta, Detroit and Miami. They recently added Phoenix to the list. On June 12, FHFA officials held a town hall-style meeting at the Arizona Capitol Museum in Phoenix. The outreach event gave community leaders the tools and information they need to reach out to homeowners across the state. According to government statistics, around 10,000 homeowners in the Phoenix metro area currently qualify for HARP, and could therefore save money on their monthly payments by refinancing into a lower rate. The agency’s message boils down to this: Eligible homeowners in Arizona could refinance their existing mortgage loans through HARP and save, on average, more than $2,400 per year. That’s because today’s mortgage rates are lower than those assigned to many home loans across the state of Arizona. By refinancing into a loan with a lower interest rate, homeowners can reduce their monthly payments and the total amount of interest paid over time. This could add up to significant savings over the repayment term. But the low mortgage rates we’ve seen in recent weeks might not last long. Last week, the average rate for a 30-year fixed home loan rose to 4.04%, up from 3.87% the week before. Many experts believe they will continue rising between now and the end of this year. Such a trend would close the refinancing “window” for many homeowners. To learn more about this program, or to find out if you are eligible, visit HARP.gov.